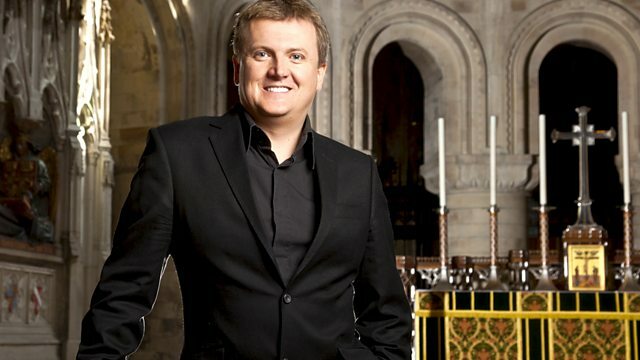 Aled Jones goes to the zoo to discover why the animal kingdom fascinates us and introduces hymns and songs in celebration of creation. Browse content similar to All Creatures Great and Small. Check below for episodes and series from the same categories and more! cos today it's all about the animals. I know what you're thinking. It's going to be ZOOper! and meet the dog who is more than man's best friend. And here at Chester Zoo, over 400 species fight for your attention. to marvel at the animals. This is Liza. She's a sitatunga, a form of antelope. who's the patron saint of all lovely animals. alongside the morning chorus of the birds. you can hear the lions roar from some way away. So it's a fascinating place to live nearby. and takes a keen interest in the plight of animals. and they contribute to conservation projects around the world, too. One way of thinking about zoos in Christian terms would be to think about the story of Noah's Ark. in the story of the flood. Some would say we're the number one species. Why do we need the animals that aren't useful to us? but look much more widely. It's usually the saints that have some dealing with the animals. is very close to holiness and saintliness. and while he was praying, a little bird came and made its nest and laid eggs on top of his hand. of God's grace to human beings and to the whole of creation. but you wouldn't really expect animals to go to school...would you? and it was the brainwave of teacher Sean O'Donovan. and be caring for animals. We run an agriculture course and an animal care course. And it suits some kids. Really suits them well. We're a city school, so really this helps a lot, having animals here. how big it was, what it smelt like and so on. -But it's not really a petting farm, is it? and then the animals which are going to go in the food chain, they don't. And that's a very important distinction I think that schools need to make. -How long have you been on the course? -What's the best bit about it? Um, working with the animals. Yeah, taking care of them, seeing all the different things we've got. Working with animals in a farm is just amazing for me. -It's great having all the animals in the school, isn't it? -Why do you like that so much? from the getting in and getting dirty aspect of it? Well, I want them to enjoy it. These are exam classes that they do, so they do that as well. But they learn this responsibility - they learn caring for people. -It's the best part of my week. -Why do you love it? I just like to be outdoors. This course is just brilliant. -Being around the animals is great. -Should more schools copy yours? and how to do your own thing. This is a faith school. How does it fit in with that aspect of things? It is, and I think that's an important part of the whole setup. then they'll go on to care for people. Well, we all know the expression that a dog is a man's best friend. Look at these painted dogs fast asleep. But there are some dogs who go above and beyond the call of duty. Just her spirit, she is full of life. And a good distraction from what might be misery otherwise. She definitely takes your mind off the negative side of everything. you can't stop to think about your woes, really. was on a tour of duty in Afghanistan serving in the Parachute Regiment. They fought nearly every day, which I think is incredible. But they faced it bravely. Just last February, Conrad's patrol came under fire. He became the 353rd British soldier to die in Afghanistan. and carry on as he went on with life. because you do just want to fall on your knees and give up. how he was feeding her and teaching her to sit and give paw and stuff. that he would like to bring the dog home. So, we thought that was our job. But the odds of getting Peg home safely were extremely low. She's at the most dangerous checkpoint in Helmand Province. and then she's got to fly back and do six months in quarantine. And she's handled that as if it was a walk in the park. And at each point, somebody has helped. Somebody has helped. She's a great comfort, and it's almost spiritual, having her about. and, you know, by virtue of that, a link back to him. A reminder of him, yes. But a lovely reminder of him. always on the go, looking for the next adventure. she'd lie down when he lay down, she'd get up when they got up. I think she gave all the soldiers a real boost. it has got to be really comforting. The other thing is, we know she gave Conrad and the guys a lot of comfort. There are lots of references to animals in the Bible. to carry the Son of God into Jerusalem. as more and more churches catch on to the idea of pet services. are recalled at a Noah's Ark service. and have hardly changed over the years. and their loyalty as well. Oh, and hens. For the last couple of years, a lady has brought hens. We've never had any fights in the church. but they soon settle down. All creation is God made, and this is part of my faith. I have to look after them to the best of my ability. for having my pets and remember the ones that I have lost as well. Every day with Irwin, I feel blessed by him. that he comes today and he gets his blessing. I would like to think that all prayers are answered. Jesus told us to have concern, even for the smallest of creatures. and the fact that we've taken them to God in prayer. whose graciousness knows no limits. but also you are to every living creature, their kind and loving God. shown in the beauty of our animal companions. be upon you and upon all animals today and always. Well, I have thoroughly enjoyed my day out at Chester Zoo. that's me and my new little friends here. sing classic Welsh hymns that will stir your soul.